Karen Marshall landed the position she had long admired as heritage preservation coordinator for Chester County while–as the saying goes–she was busy making other plans. Karen’s passion for preservation and historic districts became her profession later in life after working as a marketing consultant for TV stations throughout the country. Even while she was a marketer, she still gravitated toward the historic districts in different states and did some work for cultural and historical organizations. For instance, she was a performance coordinator for the President’s Office at the College of Charleston in South Carolina and she was also a marketing consultant for historic and cultural sites in Baltimore, Maryland. But Chester County was her favorite place by far. She had been attending Chester County Day, an annual house tour organized by the Women’s Auxiliary to Chester County Hospital that features historic homes and gardens, for years before moving here. “I just loved history in general…especially in Chester County,” Karen said. In 1992, Karen moved to Chester County and has lived in Kennett Township ever since then. From 2002 to 2005, she was the executive director of the Greater Brandywine Village Revitalization Inc.
Karen landed the job with the county in 2005 when her predecessor, the late Jane L.S. Davidson, retired. She started working for the county as the heritage preservation coordinator in the Parks and Recreation Department. In 2012, that position was moved to the Chester County Planning Commission. Karen said she had a lot of respect for Davidson, who was also the co-founder of the Chester County Historic Preservation Network, the countywide organization that connects local governments, organizations, and individuals in their efforts to protect, preserve, and promote the historic resources and cultural landscapes of the county through communication and education. “Jane and a small group of citizens developed preservation and stewardship standards that the county still follows today,” Karen said. The county’s heritage network has grown from a couple of historical preservation committees to about 65 of the 73 municipalities now having historical commissions, historical committees, or Historical and Architectural Review Boards, according to Karen. These municipal organizations, which are comprised of citizen volunteers, used to be called “Jane’s Army,” she said. Karen is continuing to carry out Davidson’s historic preservation legacy with hundreds of volunteers throughout Chester County at a time when the county is preparing for its future with the development of the next comprehensive plan, Landscapes3. 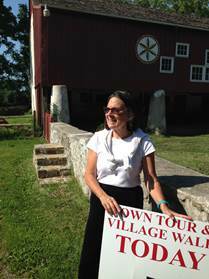 In addition to encouraging preservation projects throughout the county, Karen organizes the annual Town Tours and Village Walks every summer with the support of many volunteers. This year’s theme is the 240th anniversary of the campaign of 1777, and she is already starting to prepare for the 250th anniversary of this country in 2026. Davidson started the Town Tours and Village Walks in 1995 as a way to feature the research of commissions and private individuals, according to Karen. The goal is to inform residents about local history, and over 2,000 people attend the events every year. The tours are sponsored by the Chester County Commissioners, the Chester County Conference and Visitors Bureau, the Chester County Historic Preservation Network and the Chester County Historical Society. The county’s historic resources include over 500 National Register listed or eligible structures, nearly 100 National Register listed or eligible historic districts, five National Historic Landmark structures, and four National Historic Landmark historic districts, according to the Planning Commission. From Kennett Square’s historic district centered around its main street to Anselma Mill in the West Pikeland, Chester County’s historic resources are a foundational piece of what residents value about the county. So what does she like best about her job? Karen, who has a bachelor’s degree in English from Boston University and a master’s degree in Urban Affairs and Public Policy from the University of Delaware, also enjoys providing technical assistance to volunteers and organizations. For example, she has worked with the Brandywine Conservancy over the years and was recently featured in a video about heritage preservation.